The Greater Tunapuna Chamber of Industry & Commerce in collaboration with partner Business Chambers and Rotary Clubs of the East Cluster present 'Understanding where we are today - Trinidad and Tobago' on Monday 17th September from 7:00 to 11:00 am at Petrea Hall, Centre of Excellence, Macoya. 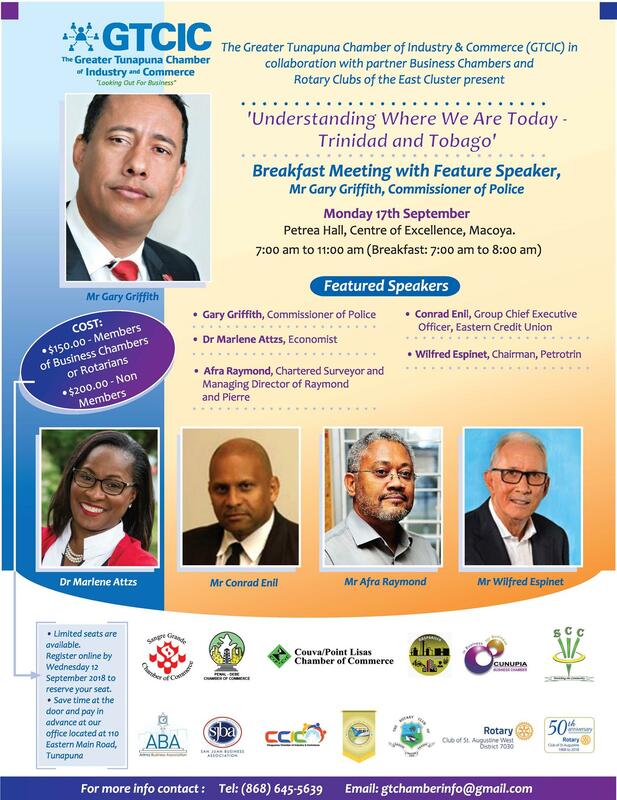 Feature Speakers include: Gary Griffith, Commissioner of Police; Dr Marlene Attzs, Economist; Conrad Enil, Group Chief Executive Officer, Eastern Credit Union; WIlfred Espinet, Chairman, Petrotrin and Afra Raymond, Chartered Surveyor and Managing Director of Raymond and Pierre. Price: $150.00 (Members of Business Chambers and Rotarians); $200.00 (Non-Members).